Carrots and Jaffas by Howard Goldenberg opens with the heart-stopping scene of a child being stolen. The child is one of twins. While the story of the twins, their birth and their fates, is central to the narrative and binds the reader by a need to know the outcome, the book ranges over many other stories as it takes us there. Actually, it doesn’t just range, it digs deeply into these other stories. As the twins narrative progresses, the reader has a sense of entering several books in parallel. With each character, comes new subject matter and, personally speaking, new and fascinating information. The book manages to be both deeply moving and matter-of-fact. This is meat for the curious, manna to the open-minded and satisfaction for the intellectually hungry. It is packed with poetry, fantasy, humour and fact and I enjoyed every word. Howard has set the book in his native Australia, and offers a depth of intimate knowledge about the continent and both its modern and indigenous peoples. This is a revelation to the non–Aussie reader (and you might need a map). He draws on his decades of work as a doctor with all these people. I am now happily anticipating reading his memoir, My father’s Compass, and Raft, his account of life as a doctor in remote, indigenous Australian communities. He also blogs entertainingly and with passion at http://www.howardgoldenberg.com. 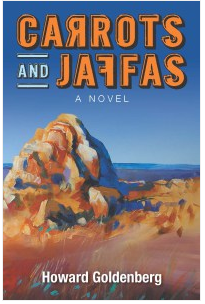 This entry was posted in Reading, Writing notes and tagged Australia, book review, Carrots and Jaffas, doctor, Fiction, Howard Goldenberg, Indigenous Australians, medical practice, medicine, My Father's Compass, Raft, reading, Twins by hilarycustancegreen. Bookmark the permalink. It kept me company on train journeys to a writing course, and they passed very swiftly. You will have read ATLMD, no doubt. That is the other one I am giving to friends. Thanks, I’ll take a look at that – can you give me a blog address for Dennis. Hope you like what you see of Border Line. You have a marked knack for writing appreciations. This one is highly quotable.